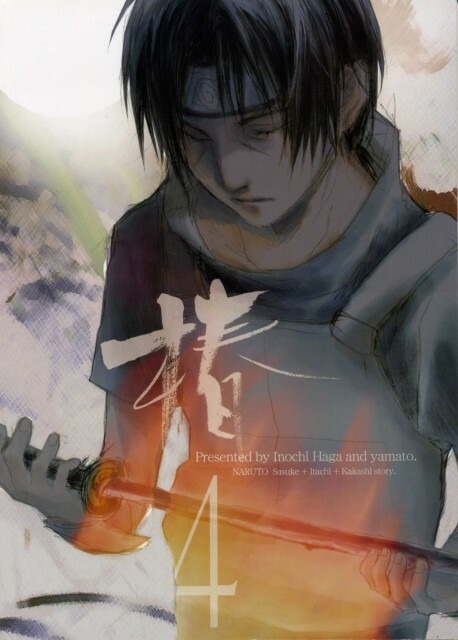 Yatai Senjyo: Itachi ~"Tsubaki 4"
Minitokyo »	Yatai Senjyo Scans » Yatai Senjyo: Itachi ~"Tsubaki 4"
The cover of the 4th volume of "Tsubaki" - "Naruto" doujinshi series by circle Senjyo Yatai (Inochi Haga & yamato). Art by Inochi Haga. So... pretty. *__* Both this and the back cover, wow, just wow. The Tsubaki series is so awesome. Wow..Itachi my FAVE! thanks for the upload!=D he rox! love it, thanks for the scan! Nice scan, thanks a lot for sharing!